Helicopter accidents occur for a variety of reasons, usually resulting from a penetration of more than one layer of safety defenses. The barriers to an accident are often described as slices of Swiss cheese, where a breach is described as a hole in the cheese. When one or more holes line up, enabling a concatenation of events, an accident usually results. 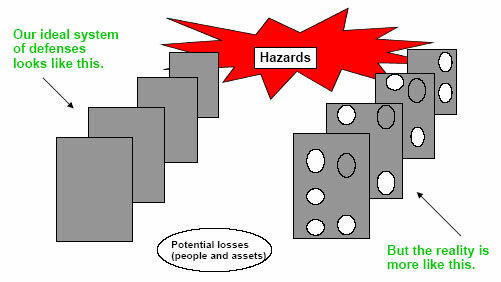 The Swiss cheese model posits that various slices represent barriers to an accident or incident, and that holes in the cheese represent imperfect or nonexistent defenses. When the holes are in alignment, disaster frequently unsues. 1. Operational safety, the opposite of which is here defined as pilot and/or ground staff error. Human error can occur in flight planning, the conduct of the flight, the role played by air traffic control, or the contribution of cockpit displays – or the lack thereof – exacerbating the potential for human error. A substantial proportion of helicopter flights are made at night, so the element of human fatigue must be considered, as well as the reduced visual cues necessary for safe flying at night. For example, antenna guy wires may be less visible at night, placing a premium on obstacle avoidance. Not confined to night time operations, but a definite factor is weather, and the sudden shift from visual meteorological to instrument meteorological conditions, which can catch even the most experienced helicopter pilot unprepared. Rarely mentioned in official accident reports is the presence of a lone pilot in the cockpit. Although helicopters for the most part are designed for two-pilot operation, the economics of the industry push many operators to fly their helicopters with one pilot. This situation can lead to added fatigue, task saturation, and poor decision making. Contributing to the issues of a single pilot, the lack of timely or appropriate support from dispatchers, air traffic control and other ground support staff (e.g., emergency medical personnel coordinating patient pick up) as well as the lack of warning systems in the helicopter, such as Terrain Avoidance Warning Systems (TAWS) or Collision Avoidance Systems (CAS) to warn against the presence of other aircraft in the vicinity can also lead to an accident. Suffice to say, operational errors account for most helicopter accidents, usually human failure is usually abetted by a number of factors alluded to here. Pilots do not embark on a flight expecting it will culminate in an accident, so the full panoply of operational and technological factors must be evaluated. 2. Maintenance safety ostensibly assures that the helicopter is in airworthy condition for a flight. Maintenance safety is not only directed at the mechanical functioning of the helicopter’s blades, rotor hub, engine and transmission; it is also directed to the electrical and avionics components of flight critical software, communication and navigation equipment. Certain components must be lubricated regularly, as failure in flight can be catastrophic. For example, the transmission requires periodic lubrication and inspection because its failure in flight cannot be ameliorated through superior piloting. Failure of the transmission usually means loss of the helicopter. Therefore, helicopters depend on proper maintenance, proper installation of parts, up to date manuals, good quality control, and thorough supervision by qualified maintenance inspectors. When one or more of these elements is lacking, a maintenance related incident or accident is sure to follow. 3. Design safety, which is to say the adequacy of the manufacturer’s design to assure against catastrophic failure in flight. Inadequate design, inappropriate testing, or faulty manufacture can all contribute to a lurking latent failure. For example, locating the pilot’s primary flight display (PFD) in a corner of the instrument panel, rather than directly in the pilot’s primary field of view, can lead to loss of spatial awareness in flight. Or the close placement of hydraulic and oil fillers can lead to confusion between the two, with a likely committal of maintenance error. 4. Regulatory safety, or the crucial role played by the Federal Aviation Administration (FAA) to assure that the operators procedures and practices are in accord with regulation, and that air traffic control personnel are qualified and attentive in the exercise of their duties. The FAA issues the operating certificate to a helicopter company, thereby attesting to its fitness to conduct business. If FAA inspectors and auditors are not performing their job in a thorough and timely manner, then oversight is lacking and errors are poor procedures can contribute to an accident. The FAA is the ultimate guarantor of a minimum level of safety; when the FAA is derelict, regulations are breached and it is only a matter of time before disaster ensues.